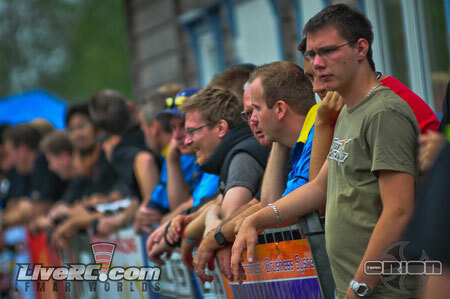 Welcome to the official LiveRC race blog for the 2011 IFMAR 1/10th Off-Road Worlds! Here, you will find photos, written recaps, and results updated throughout the course of the event. You may also find me babbling semi-incoherently about various things that are on the fringe of relevancy, and for that I apologize in advance. As I write this, the LiveRC crew is nearly done setting up the TLR Broadcast Center (as I sit amidst the chaos typing). *There is no real point to this last bit of information. I just figured I would do my best to paint a picture of what being here is like. 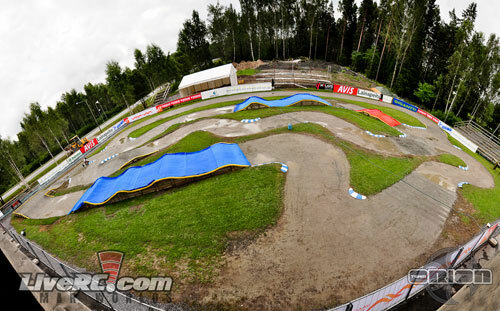 The track here in Vaasa (I�ve yet to figure out if it has a name. If it does, it�s not likely that I would be able to pronounce it anyway) is, quite simply, an electric racer�s dream. The dimensions are perfect for 1/10th- not too big, not too small. The driver�s stand ('Rostrum' for our European contingent of readers) could easily house a family of four comfortably, and the overall organization of the event appears to be top notch. The organizers have coined the term �coolest race ever� to describe the event on T-shirts, flyers, and elsewhere. So far, they are on track to prove the statement true. At least three times larger than my apartment. As far as racing goes, this week should mark the return of the IFMAR Worlds as a benchmark race for 1/10th off-road racing. 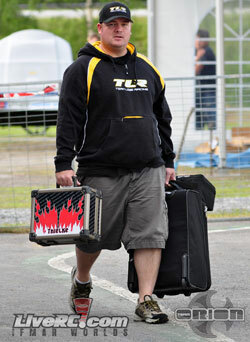 As many of you know, the 2009 IFMAR 1/10th Worlds in South Africa was marred by a severely low turnout caused by a lack of support from race teams due to (insert your version of the story here). Since then, the electric scene has once again risen to prominence throughout much of the racing community, thanks to the continuing evolution of motor and battery technology, and the release of new cars from manufacturers. 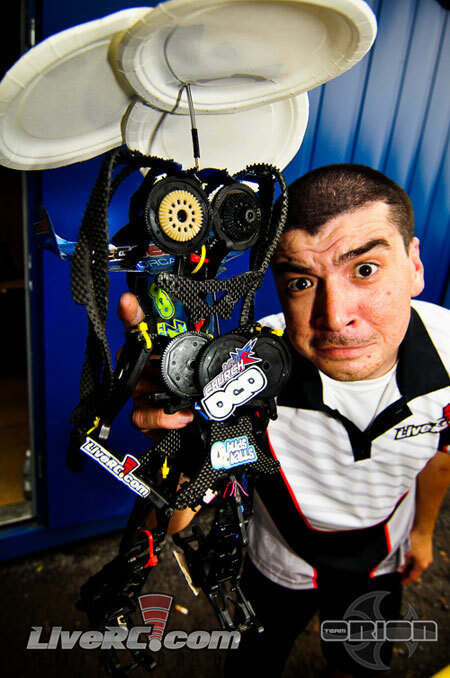 The world�s best drivers have all been running electric off-road religiously this year in hopes to capture what might be, arguably, the most historic and prestigious radio control racing title there is- the 1/10th IFMAR Off-Road World Championship. 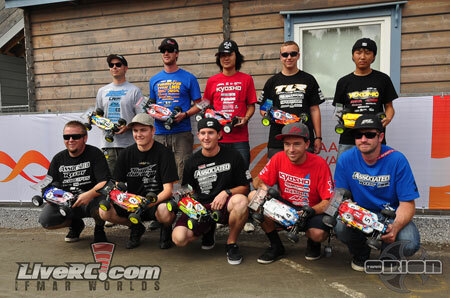 Not many drivers are privileged enough to have an IFMAR world championship. 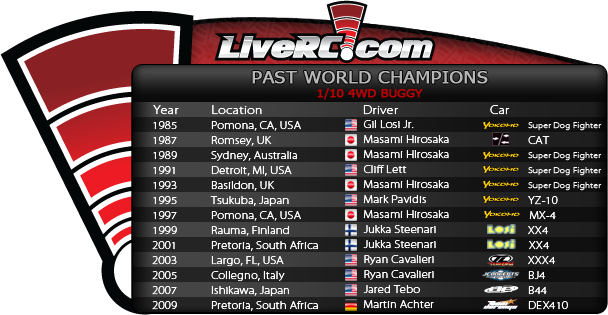 In fact, the list of driver�s who have been able to win a 1/10th off-road title reads like it's a roster for an All-Time R/C All-Star team. Masami Hirosaka. Brian Kinwald. Matt Francis. Joel Johnson. 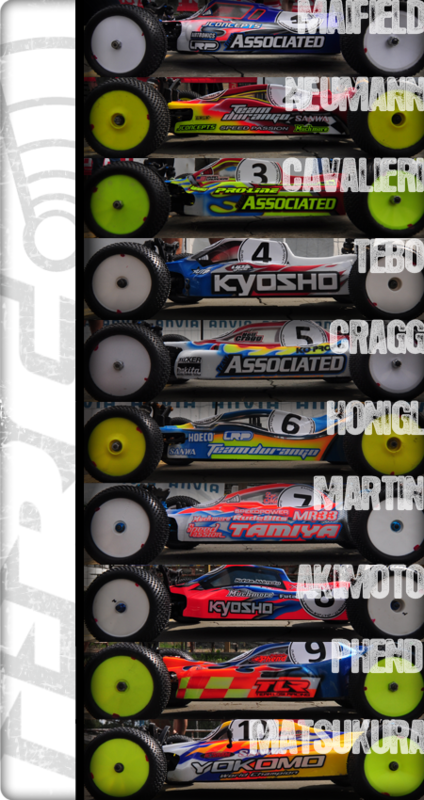 If there was a Hall of Fame for R/C racing, these people would all be inducted immediately. 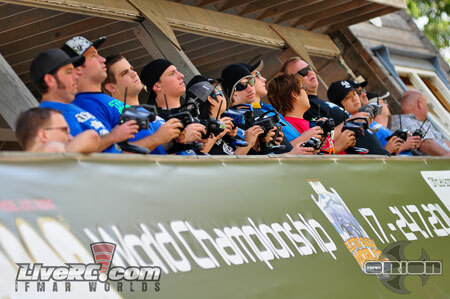 Winning the 1/10th worlds is arguably the highest achievement one can accomplish in R/C racing. To win this week, a driver is going to have to possess a combination of blazing speed, cold-blooded consistency, and a level of precision that only years of top-level practice will produce. This week, two names will be added to the list. They may be repeat champions, like Neil Cragg or Brian Kinwald. 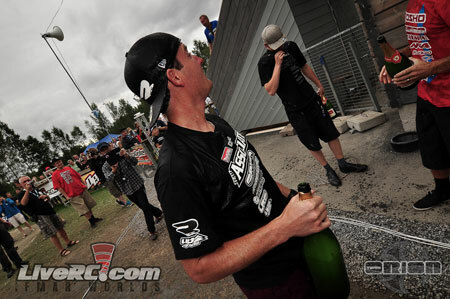 It could be Ryan Maifield, who has won everything on Earth except an IFMAR title. It could be Jared Tebo, who is arguably having the best overall year out of anyone so far in 2011. Or, it could be someone like Lee Martin, who has quietly and consistently placed in the top 5 at numerous international events so far this year. Whoever wins, one thing is for sure- their name will be forever sewn into the fabric of R/C history. My point is: it's going to be one hell of a week! 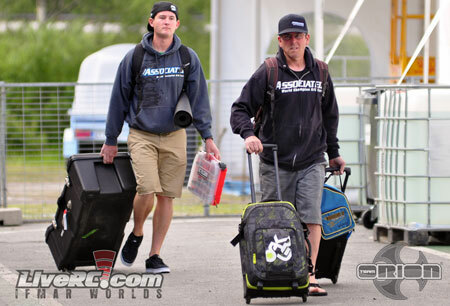 Tomorrow is check-in day for drivers, as well as the event�s opening ceremonies. Monday we dive into actual action on the track! MC Charlie Suangka will be here giving you play-by-play, interviews, and more once practice gets underway. This race will be an All Access Pass event, meaning we will have moving HD cameras and announcing! The price for AAP will be $30 (US), or $25 (US) for Bonus Lap members. 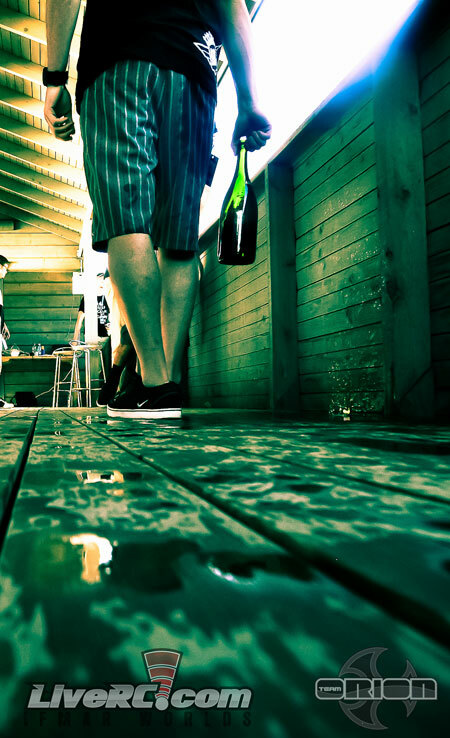 It�s check in day here in Vaasa, and things are going about how you would imagine. Drivers and mechanics have been filing into the pit area with their equipment all morning before slowly making their way to the check in table, and vehicle inspection. Apparently Thielke needed a hand with his radio. The Dogg family arrives- Lou Dogg and Ryan...Dogg. Apart from that, drivers are also getting a chance to reacquaint themselves with old racing friends they may not have seen in awhile. One particular such moment came between Masami Hirosaka and Brian Kinwald, whom embraced each other with a secret handshake followed by the universal language of laughter. It looked as if the two men hadn�t seen each other in some time. It was definitely cool to see two of the most legendary drivers the sport has ever seen exchange pleasantries with one another a mere ten feet from me (I�ll admit it- I�m an R/C dork. 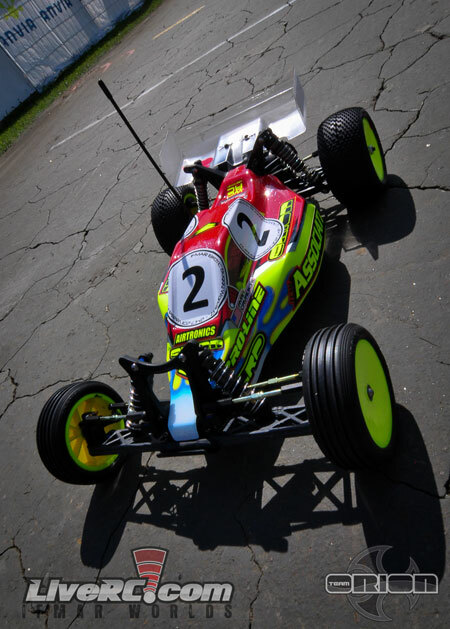 I still get nervous around pro R/C drivers; especially ones I�ve followed since I was a young kid). 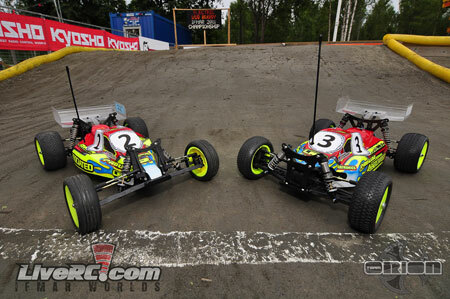 While Masami isn�t racing this week, seeing him and Kinwald (who is racing) share a laugh together made me wonder what would happen if Masami was racing�maybe he and Kinwald would duke it out for the 2WD world title one last time? 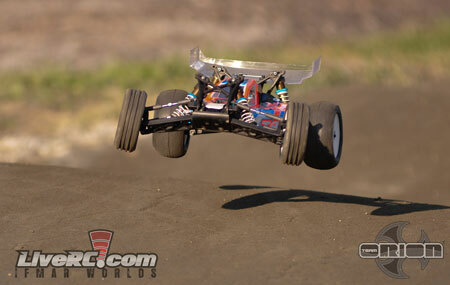 OK, maybe not, but it is a cool thing for all of us R/C dorks to imagine, right? After the first half of check-in day, one thing is for certain- the race appears to be holding a lot more meaning to people than any other electric race has in quite some time. As drivers began setting up their pit areas, it became evident that the IFMAR Worlds, and all that used to be associated with it, is back. You can tell everyone went the extra mile to make their Worlds cars absolutely perfect, just like the old days. You can feel the sense of pride each driver has in their immaculate equipment when walking through the pits. Nary a single driver has something other that a freshly painted body with custom stickers placed perfectly upon its Lexan contours. Screw heads have been polished, springs have been stripped of their powder coating, and wings have been trimmed out, perhaps, more perfectly than I have ever seen in my life. If the looks of cars in the pits can, in any way at all, translate to the quality of their racing on the track, we should be in for a good week. Now, on to what I know you all have been waiting for- NEW STUFF. 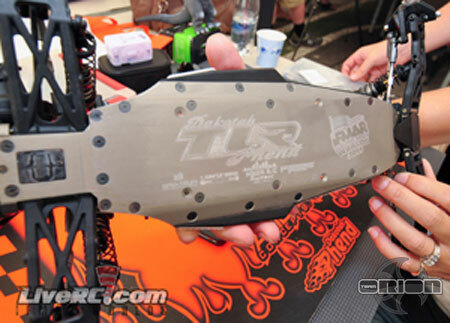 TLR- We talked with Kevin Gahan about the potential of us seeing a new TLR 4WD buggy based on the 22. He assured us that there is nothing of the sort available as of yet. 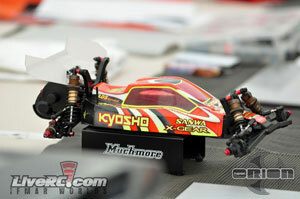 What is new from the TLR camp, however, is some various 22 hop-ups. New wheel hexes of various width were spotted on the team�s cars, as well as a new aluminum battery tray, and an aluminum rear U-brace. 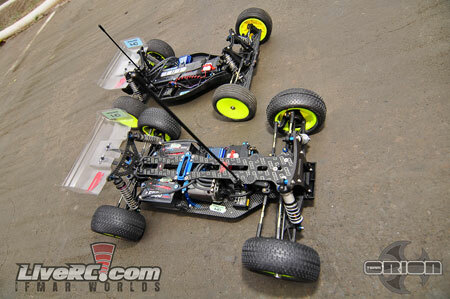 Associated- The only new thing in the AE camp at the Worlds is a prototype long chassis for the B4.1. 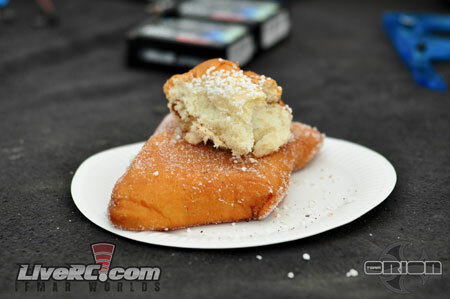 We don�t know how much longer it is, but we do know that this is the only new stuff in the pits. The long suspected and mythical �big bore� shocks do not exist as of yet, suggesting that the AE guys are more comfortable with their traditional shock package. Or, perhaps, they don�t want to risk having to figure out something new for this race. 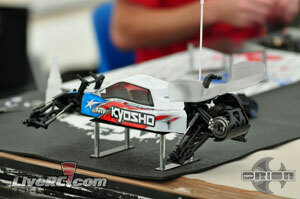 Kyosho- Kyosho has what appears to be a new rear shock tower and new rear hubs. There are other rumored changes that have occurred under the hood of their car as well, but they are keeping the bodies on them as to not let anyone see. 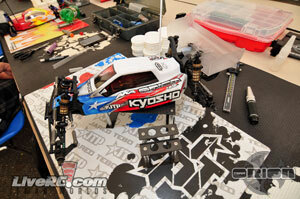 JConcepts- The AE/JC guys are running a new body on their B4.1s. The body is similar to the Punisher, only more exaggerated. Jared Tebo has also unveiled some new products from his own personal company, JTP. 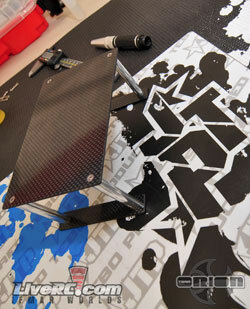 Tebo has designed two trick pit items- a car stand, and a shock stand- both made out of carbon fiber and metal. 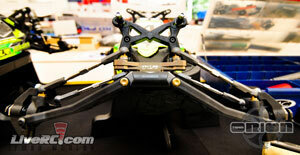 These things look pretty dialed, and show us that JTP seems poised to release products other than shirts in the future. We will try to get an interview with Jared this week to see if he can tell us about his new products and what else he has in store for JTP. 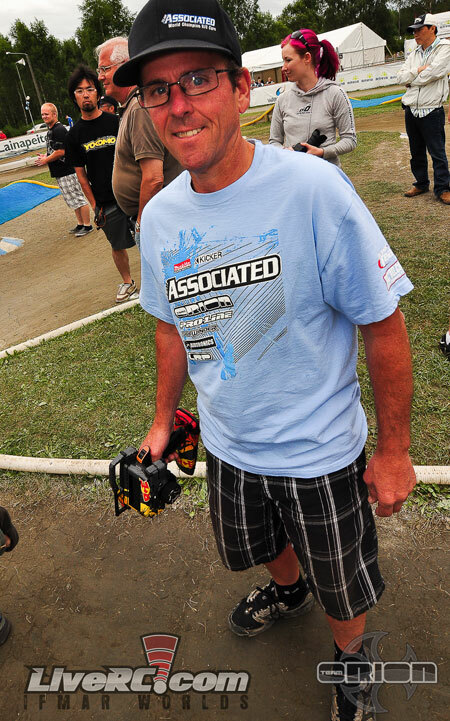 BLOOMFIELD: In �I would have never guessed that was going to happen� news, we�ve learned that IFMAR Worlds Warm-Up winner Darren Bloomfield will NOT be racing this week. According to TLR Team Manager Kevin Gahan, the reason Bloomfield will not be here is that the BRCA did not grant him entry. Apparently Darren did not run the appropriate races in the year prior to qualify for the Worlds. A stark contrast to the practice we've seen in the past of "letting people in" at the Worlds if their racing resume is legit. Apparently winning the warm-up race wasn't enough. 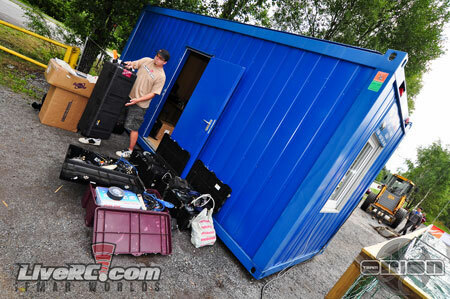 ALSO: It seems that a lot of racers had their batteries taken away on the last leg of their flight to Finland. The issue appears to have occurred to everyone who took a flight from Helsinki to Vaasa, instead of riding a train or driving. The airline, Finnair, apparently took the batteries out of the racers' checked baggage. Those who carried their batteries on the plane did not have them taken away. 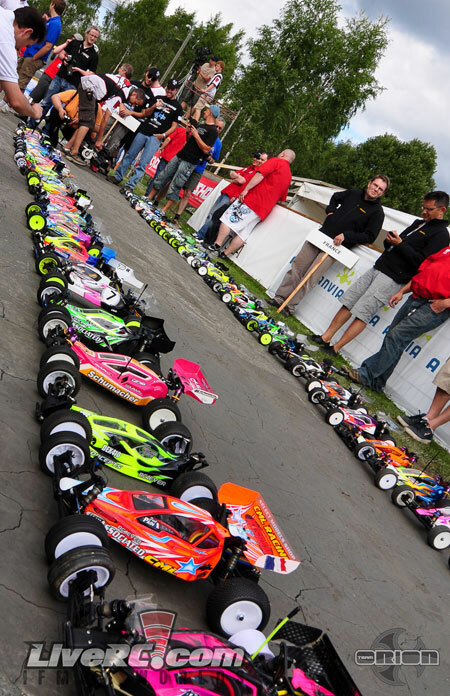 On Sunday afternoon, drivers were called to the track area for a staple event in all IFMAR World Championships- the opening ceremonies. While not quite the same as the Olympics, the R/C ceremony went off without a hitch and served as a good time for all of the countries to gather together for photos. Darren Bloomfield made an appearance in Lee Martin's chest hair. 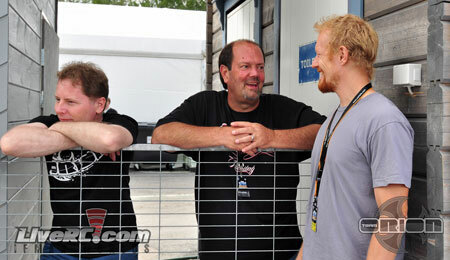 4WD WC Jukka Steenari (right) said he "wouldn't miss this event." And take a ton of pictures on his iPad! After the opening ceremonies, the "Concours d'Elegance" took place and had an amazing turnout. I have no idea who won. It may have been Lee Martin. At any rate, it was a cool spectacle to behold. Apparently these guys are cool. Jason Ruona was one of the judges. 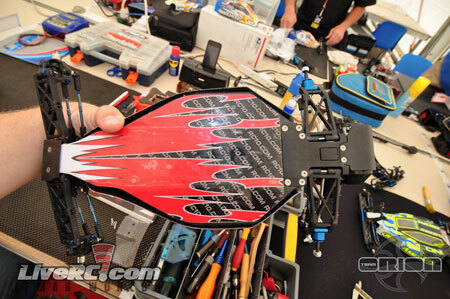 He may have been "stuffing the ballot"
in favor of JConcepts-equipped vehicles. There is probably $50,000 (US) worth of toy cars in this picture. 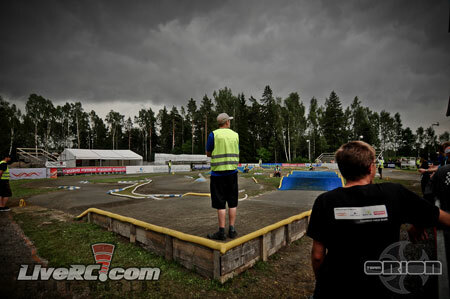 On Monday we saw the first laps turned on the IFMAR Worlds track. Eight rounds of practice were run, despite the threat of rain showers looming in the skies for periods of time during the afternoon. 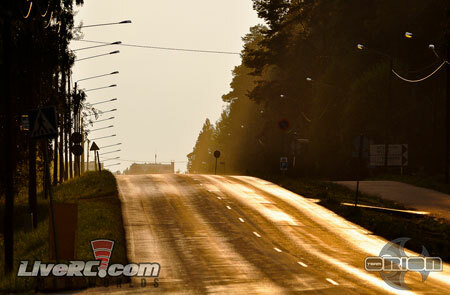 The track appeared to be somewhat greasy throughout the day, especially in the morning. Several drivers I talked to seemed to agree that choosing a conservative set-up that will keep a guy "in the ballpark" should the conditions go awry seems to be the hot ticket. Of course, this will likely change throughout the day tomorrow as certain guys become desperate to gain speed. 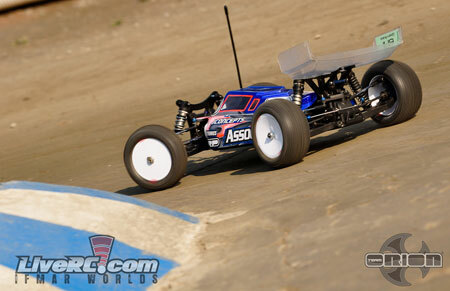 Many drivers have chose to bring two 2WD buggies to the event, especially the Kyosho team (whom are trying prototype chassis and suspension equipment on their "spare car." We also noticed a few body changes taking place throughout the day. 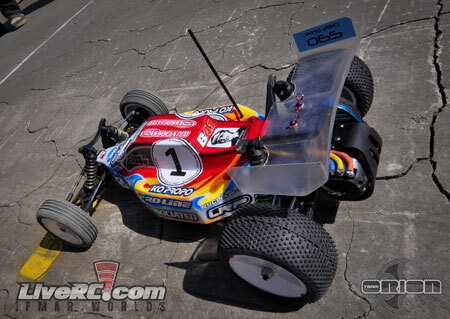 The most interesting of which, was Ryan Maifield who, mid-way through a practice heat, changed from the newest JConcepts body unveiled yesterday to the older model. We'll make sure to see which one he chooses to go with tomorrow. Brent Thielke with Ryan Maifield's B4.1, sans new JC body. Tomorrow the drivers will run one more round of practice before qualifying gets underway. As always, you can follow every second of the action LIVE by watching our live broadcast! MC Charlie Suangka has arrived via a complex combination of planes, trains, and automobiles, and will be leading our commentary starting tomorrow morning. For now, the LRC crew is going to pack up and head back to the hotel for a decent night sleep! See you tomorrow! Don't forget, we will be rebroadcasting each day's events each night (excluding next Sunday), so make sure you clear some time, whether it be during the day or in the middle of the night, to watch the IFMAR Worlds! 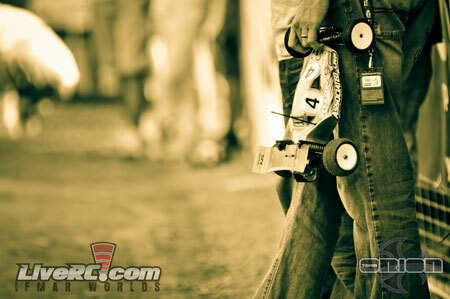 2011 IFMAR Worlds 2WD qualifying is almost history. The drivers have headed back to their hotel to relax and await their final attempt at bettering their qualifying positions before the mains. While Monday showed us who had the most raw speed in a no pressure situation, today gave us the first real glimpses as to who is going to be contending for the world championship. Personally, the most impressive driver I saw today was young Dakotah Phend. The youngster from the USA parlayed his third-best lap time from yesterday into an equally solid performance in today's qualifying. 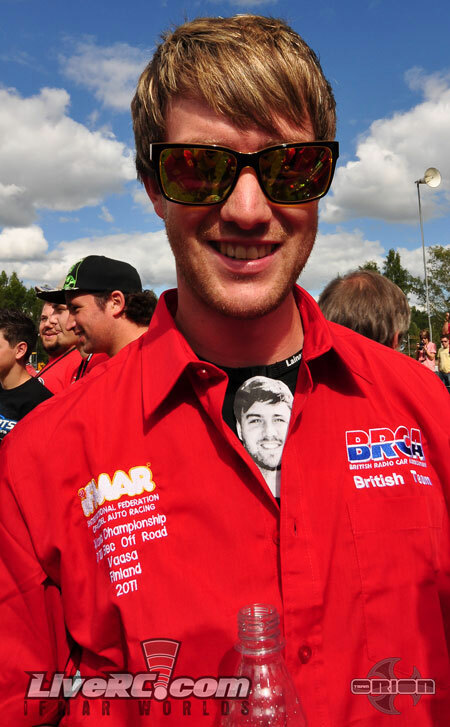 He is currently fifth overall, but possesses the speed required to be a threat in the mains. Perhaps the most telling sign that Phend could be a threat tomorrow was the way he carried himself during qualifying. Cool, calm, and collected, Dakotah never seemed rattled by the fact that he is running in his first electric worlds. 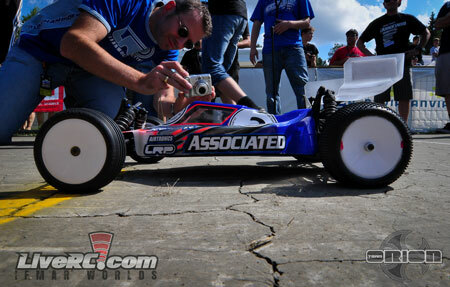 Team Associated's Ryan Cavalieri was, perhaps, the strongest looking competitor of the day. 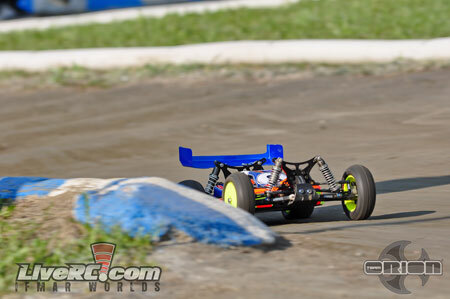 While Jared Tebo TQ'ed two rounds and Cavalieri only TQ'ed one, Cavalieri seemed to have faster laps at his disposal. 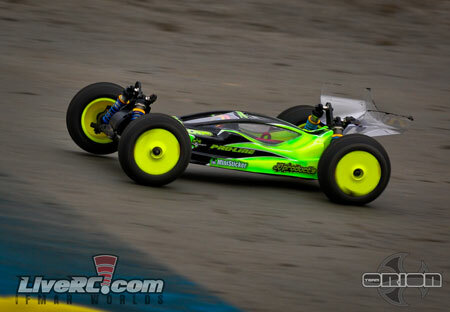 Of course, a handful of fast laps alone won't win you a championship, but it certainly can't hurt...and Cavalieri knows a thing (or two) about stringing those laps together to win an IFMAR World Championship. Ryan Maifield quietly had a stellar day. Athough not TQ'ing any rounds, or leading much time in any of his heats, he is currently tied for the overall TQ with two seconds and two threes. Of course, the odds are against Maifield getting the top spot due to Tebo's two top qualifying runs and Cavalieri's TQ and second, but a decent chance still remains, nonetheless. The biggest "talker" of the day, was the performance of Japan's Naoto Matsukura. Naoto, known for his balistic, high risk-high reward driving style, put together one of the prettiest runs we've seen in R3. Naoto hit every line- perfectly. Seeing him rail his car around the track is always fun. Seeing him drive that way and run clean lines as well was as entertaining as it gets. Tomorrow the drivers will run one round of practice at 8am, followed by the final round of qualifying. 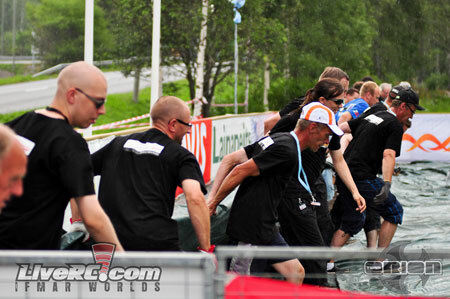 Then we will jump into the main events and work towards crowning the new 2WD world champion! Martin Achter's brief reign as World Champion has come to an end at the hands of Ryan Cavalieri (and about 40 other drivers). The professional from Southern California out-drove a field of world-class talent to capture the crown in front of a lively crowd in Vassa, Finland tonight. The honeymoon was quickly over for Cragg, however. The elite Brit, and former 2WD WC, had rough luck with the quad jump in the first two mains causing him to tumble through the field. Cragg wasn't able to recover enough to contend in any of the three main events. Jared Tebo continued the streaky performance we've seen thus far in the 2WD portion of the event today in the finals. Tebo smoothly wheeled past three wrecked Associated vehicles en route to a dominating victory in A1. At this point, it seemed like he had gained enough momentum to have the strongest chances of winning out of anyone, despite his fourth place starting position. But like he had done in qualifying, Tebo wasn't able to recreate the same successes in A2 and A3. Second place finisher Ryan Maifield was in contention for the win essentially until Cavalieri crossed the finish line in A3 a corner ahead of him. Had Cavalieri stuffed the last corner and Maifield had gotten by and finished with a faster time than Cavalieri did in A2, Maifield would have won the title. Instead, Maifield tucked in behind his teammate and locked down the second position overall; a result he seemed content with, even though he desperately wanted the win. Tomorrow (Thursday) is an off-day to allow drivers to check in and glue their tires for the 4WD portion which starts Friday. Aa a result, the LRC crew will also be taking a rare off day. 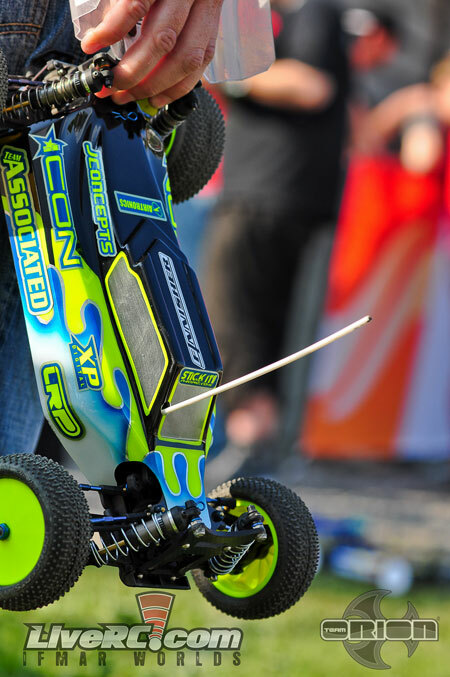 See you Friday for the 4WD IFMAR World Championship! 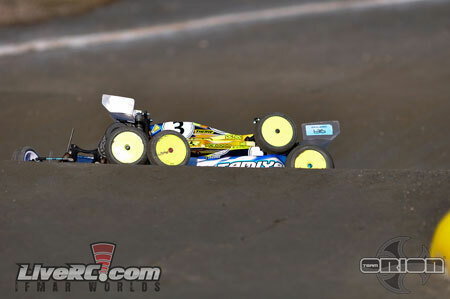 After a much needed day of not doing much, both the drivers and LRC were back in action on Friday afternoon for the first day of the 4WD program here at the IFMAR Worlds. 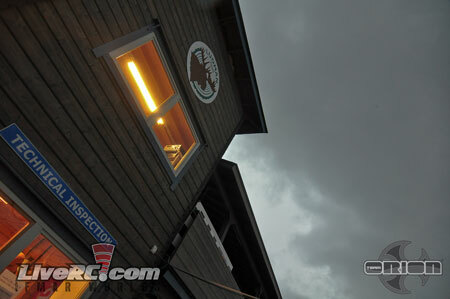 Eight rounds of practice were run today, finishing up right as dark rain clouds moved into the area. Without getting into too much boring detail (this is just practice, after all), we learned a few things today that many may have been able to guess. 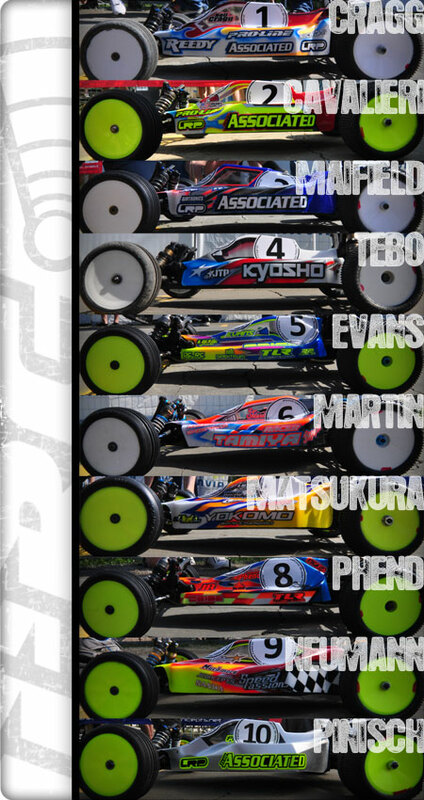 First, it's safe to say that Maifield and Matsukura can probably hot lap anyone on Earth. Seeing these two guys utilize a 4WD buggy's extra two driven wheels is a sight to behold. 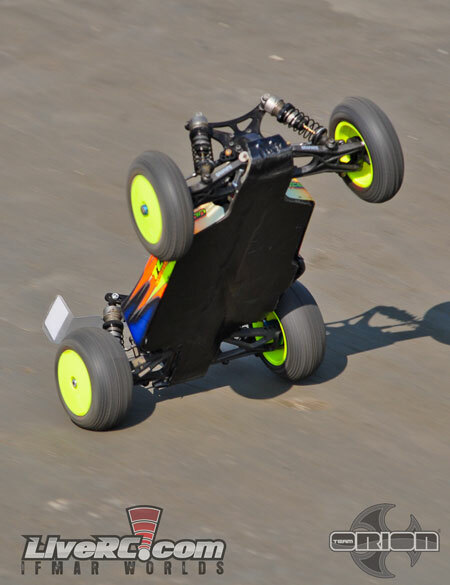 They TQ'ed practice from a hard-driving perspective. But a lap won't win a race that consists of many laps. (Was that a John Maddenism?) 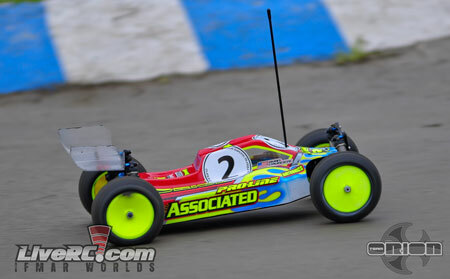 The strongest and most consistent driver throughout the day was Team Associated's Ryan Cavalieri. Fresh off wrapping up the 2WD world title, Cavalieri looked uber-confident as he finessed his B44.1 around the chicane-filled track. Another driver worthy of noting is Joseph "JQ" Quagraine, who is performing considerably better in 4WD than he did in 2WD. Driving a Durango, Quagraine showed great speed throughout the day and looks as if he has a strong chance at contending for a spot in the A-main. Tune in tomorrow for four rounds of qualifying! Well, after lurking in the background for a week, the rain clouds finally decided to open up and grace the IFMAR Worlds with their inconvenient presence. But today was mostly sunny, so let�s first focus on the that. After a brief round of practice, R1 was quickly underway. 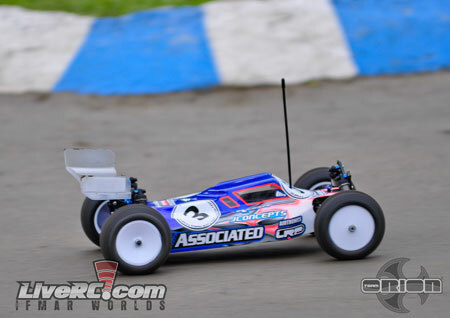 Team Associated's Ryan Maifield overcame a rough start to win the A-qualifier and take the TQ for the round with a 13/5:18, followed by the other two-thirds of the 'Big Three'- Tebo and Cavalieri. 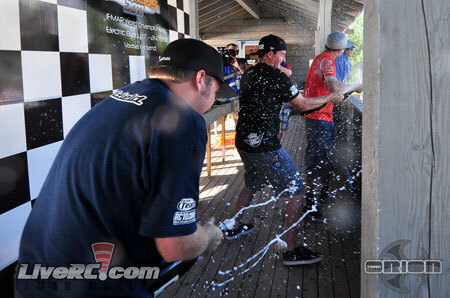 In R2, Maifield was again dominant, bettering his R1 time by five seconds. 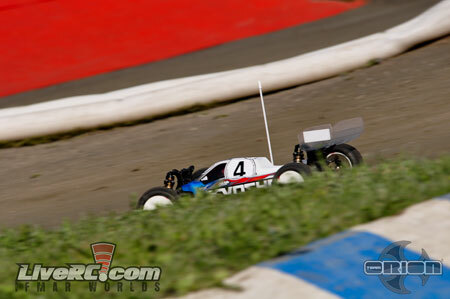 TLR's 2015, 2016, 2019, 2021, 2024 IFMAR World Champion (based on the LRC super-computer's simulations) Dakotah Phend built on his ninth place finish from R1 by doing 13 laps in 5:19 to finish third. and then blowing out. Redemption? 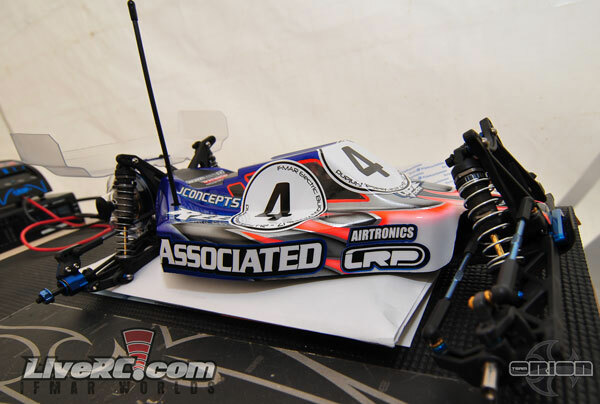 In R3, J�rn Neumann powered his way to the front of the field with his Team Durango DEX410. It was shortly after this point when Mother Nature made her first appearance of the day. Despite Scotty Ernst's attempt to speed through the round before inclement weather hit, the rain began to fall with one race to go. The tarp was pulled on to the track whilst Cody King cheered from the sideline (this actually occured). King, whom had been informed by Brian Kinwald that as soon as a delay was called, the round would be nixed, was pumped at the prospect of his dismal DNF round not counting. 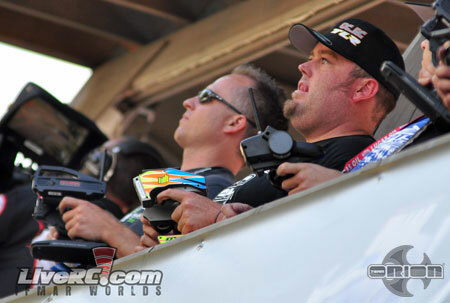 King was one of many who questioned what IFMAR would do with the almost complete round. But once the rain stopped, it was announced that the round would continue, which was nice because it made the last two hours of everyone's' lives not a complete waste. The round commenced after a delay, and quickly finished in dry conditions. in the "JK" (as in 'just kidding') round, Jared Tebo looked set to secure TQ after winning the A-qualifier. However, our friend Mother Nature returned, apparently pissed off because of our attempts to defeat her earlier. This time, the rain poured and it was quickly obvious that the day was done. The half-completed round was crossed off the sheet and will count for nothing (except than some extra practice for half the field). Tomorrow morning will begin with R5 of qualifying, which will essentially serve as R4 of a now four-rounded qualifying structure. We've been told that the drivers' best two rounds will now count towards their final qualifying positions, as opposed to the best three we were scheduled to count under the five-round model. 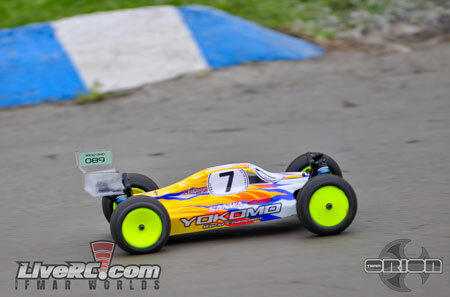 ...Which means, Ryan Maifield, after playing second fiddle to someone else in every 2WD qualifying round, has now secured at least a share of the overall TQ, with J�rn Neumann being the only other driver capable of starting first on tomorrow's grid. The final round of practice has been run, and now we await round five of qualifying. 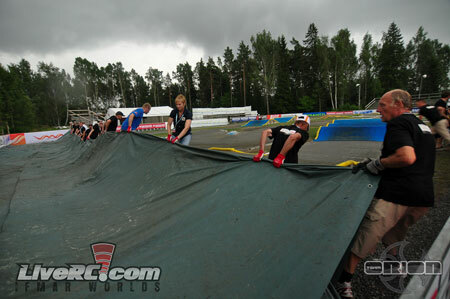 But we may be waiting a bit, as rain has began to fail and the track has been tarped. Here is how things will break down should there be rain at any point during the day. If round five of qualifying is cancelled, the starting order will be determined by the drivers� best two our of three round finishes. If round four is run, it will be best two out of four. 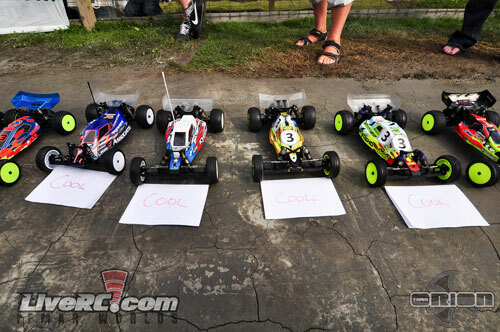 If Neumann TQs R4, he will automatically gain overall TQ as his time in R3 is faster than Maifield�s times in R1 and R2. Tiebreakers will be determined by the fastest time in the driver�s highest round finish. 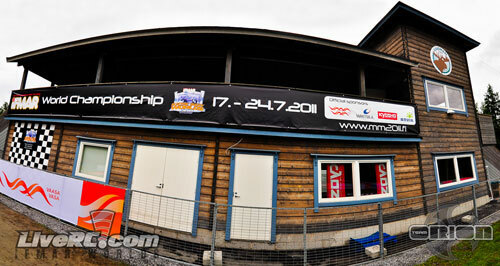 If the mains end up being cancelled, the finishing order will be exactly as they qualified. 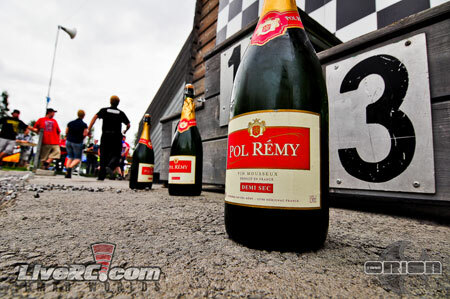 If one main is run and then it rains, the finishing order of the first main will determine finishing order. If two mains are run and it rains, the driver�s best main finish will count with the tiebreaker being the fastest time of that particular run. If all three mains are run and then it rains, the LRC crew loses because we have to pack up in the rain. 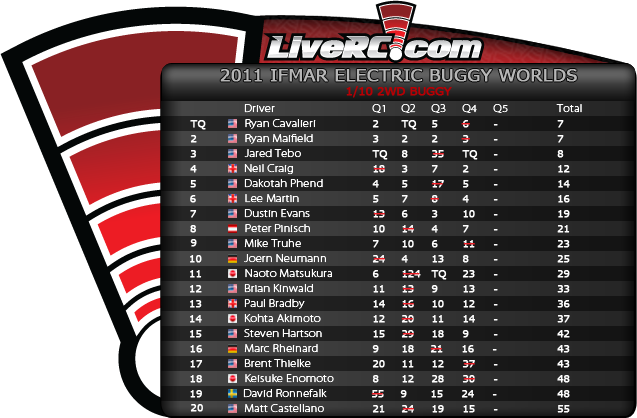 A1 was a disaster for some, and a gift from the R/C Gods for others- most importantly, Ryan Cavalieri. 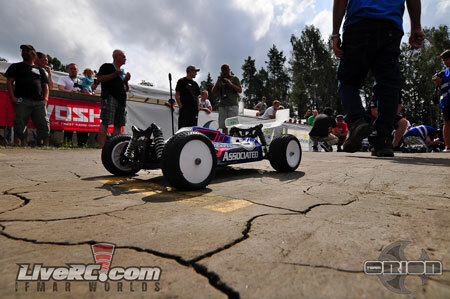 The 2WD champ was able to capitalize on J�rn Neumann�s technical problems, which struck while the German had huge lead with only a few laps to go. Pretty much every driver in the top half of the field flirted with the lead but were unable to run more than two corners in succession without doing something stupid. Cavalieri was fortunate to gain the lead late in the race when there wasn�t much more time for him to throw it away like everyone else did. 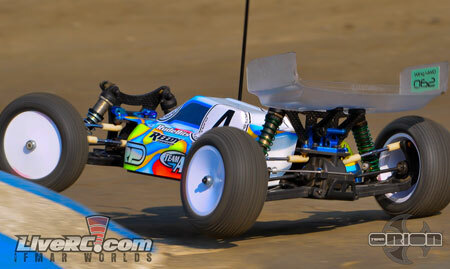 A2 is one that TQ Ryan Maifield would rather forget. 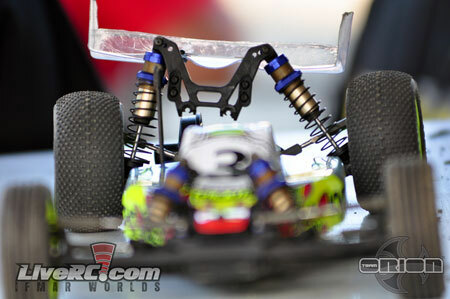 It marked the second main in a row in which he was unable to hold the lead, and also marked the last main of the 2011 IFMAR World Championships in which the elusive world title was still available to him. 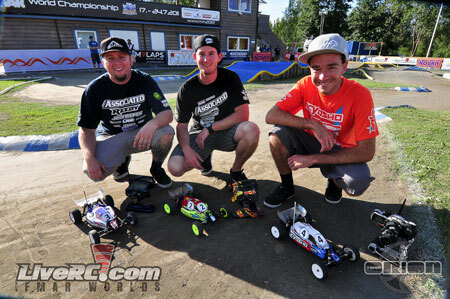 Team Associated�s Ryan Cavalieri was able to secure the overall win in A2 after starting fourth on the grid, and battling his way through Jared Tebo, J�rn Neumann, and teammate Ryan Maifield. Maifield came up short on the quad, which allowed Neumann and the rest of the top three to pass and run off hiding. Neumann appeared ready to avenge his misfortunes from A1 and wheel his way to victory, but Cavalieri tracked him down within a couple laps. Neumann then carried a wheelie a little too aggressively through the washboard section and did a dragster-flip off the end of the track, allowing Cavalieri to take the lead and never look back. 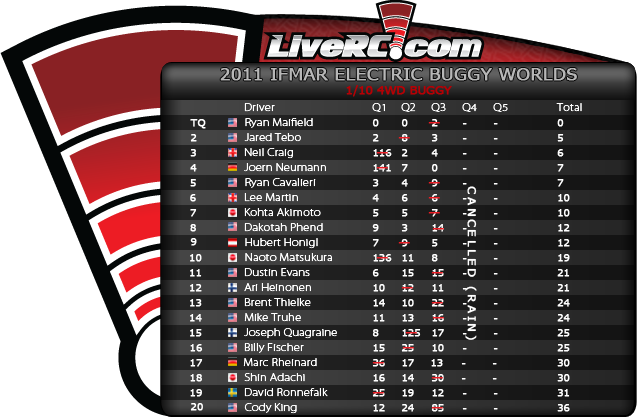 Well folks, that about does it for LiveRC�s coverage of the 2011 IFMAR Off-Road World Championships. We are now packing up for the long journey home (which includes 12 hour layover- yuck!). We hope you enjoyed our live broadcast as well as this race blog! With this blog, we tried to give you a little more personal interpretation of the events that took place, rather than the typical journalistic style of reporting (for two reasons- A: traditional journalism can be dry and boring and B: I simply don�t have enough time to go through the pits taking notes of every little thing that happens every day while also running the broadcast). So with the LRC crew diligently working into the night (or �extended sunset,� rather), I bid you farewell! BK would love to get a third world title. A BK Triple Stacker. Naoto had the fastest lap. And probably the slowest lap as well.